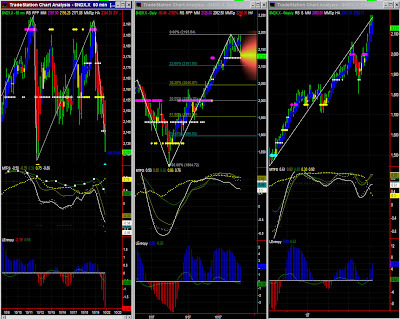 Dominant TF: Daily and low time frames (15mins)Swings: DN-DN-UPMarket direction: Down but until support is found. We have warned of a pending correction since last week, even if we could not pinpoint exactly when it would happen. The market entered a clearly defined [2156-2188] trading range, bumped on the high end (so called 'stall' level identified on Oct 11th) then reversed sharply. 60mins: Down.Despite we saw it coming, the strength of the correction still suprised us. Having said that is has been commensurate with the exuberance of the market in the last few months.The bottom has not been found yet. The 2125 MM level will be tested immediately, but support will have to be found lower, possibly 2117 or ... 2090! Despite Friday's correction, we still have a blue bar, and MTFS and Entropy while weaker do not indicate a market crash going forward. If the 2125 level is broken, we'll watch the next Fib retracement levels with more attention. A market correction is obviously possible, yet one should not jump to conclusions as we do not have signs of a reversal situation. It is only a high-volatility yet normal profit taking pattern, at least for now.